"God will delight when we are creators of justice, justice and joy"
I wasn't sure how the service would go, nor did I expect my emotional response. All I knew was the sanctuary's atmosphere was saturated with stress, anger, and sadness. It was the first Thursday Chapel Service at Drew Theological School after students and faculty returned from the United Methodist Church's Special General Conference in St. Louis. The conference voted in support of the ‘Traditionalist Plan’; ultimately, prohibiting members of the LGBTQIA+ community from serving as clergy. While there may be lingering legislative action that may determine the plan "unconstitutional”, grief was Thursday’s overtone. I could only describe my Drew family metaphorically in a recent email: "They left as balloons full of excitement and joy...they've returned deflated and with more punctures needing healing and air to fill them up again." Thursday Chapel Services often become a place for communal healing and prayer after devastating incidents (Las Vegas shooting, Stone Douglas High School shooting, Hurricane Harvey, etc.). I wondered how a wounded community would gather this time. Nothing echoed the sanctuary walls except for chairs squawking and the occasional “sniffle”. That is until Mark Miller, an openly gay, UMC leader and professor at Drew, sat down at the piano and played the opening E Chord to “For Everyone Born”. “We will NOT be silent!” Mark proclaimed as he led the congregation into song. Before long, people were standing, clapping, some grabbed various percussion instruments, while others stood together in groups hugging, crying, and singing. Within a few verses, the chapel came alive. There was a new energy reverberating through the previously mute walls. Hearts were still mourning and longing for justice, but continued beating with palpations of joy. I will never forget this worship service, or how the ministry of music resurrected a lifeless community. May we never forget the power of song and the ways in which it unites, empowers, and heals. May we too continue singing songs of justice and joy. Just a thought about [singing] mission. Christmas will be here shortly and that means there's lots of "questioning and concerning" ahead. Travel, housing, food, activities, traffic, gifts..But how often do we think of our 'why'; the reason(s) why we travel, why we're willing to stand in TSA lines, why we prioritize being together? Luke 3 tells us John, the son of Zechariah, traveled the wilderness sharing the good news to the people. The crowd responds thinking he, John (the preparer) is the Messiah; the reason to celebrate. John quickly corrects them saying, "one more powerful" is coming. John diverts the focus from him to the reason to celebrate. I can't help but connect to the people in Luke 3. I'm often fixated on the preparation and logistics of the holiday season, rather than the celebration of "Emmanuel". I want to change that. This year, I want to breathe the Christmas spirit, and connect with those around me; my reason for gathering. It's time I set my "questioning and concerning" aside, and welcome my true reasons to celebrate. Sunday morning, Emma and I attended the Woods Chapel congregation in Lee's Summit, Mo. After the service, (per usual) I stood around talking with friends on the front stage when Emma came up to me. "There's a lady in the back." she said quietly. I stepped away from the group and looked down the sanctuary aisle, out the door, and into the fellowship hall. Sure enough, there was a lady sitting by herself on a bench. Since we are not members of the congregation, we found my Uncle Curtis (a Seventy and Woods Chapel attendee) to greet the lady together. An immigrant from Iran, this was Mary's first time attending Community of Christ. Through broken English and help from Google Translate (English/Persian), we learned Mary obtained her Green Card and is now living with family near the church building; which she absolutely loved. Jesus Christ is important to her and she wants to share Christ with her grandchildren. "Can I come back?" Mary hopefully asked. 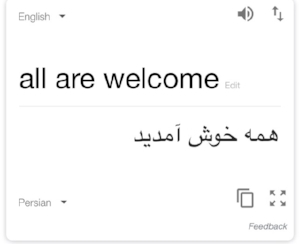 I quickly returned to Google Translate and typed "all are welcome" in the English box. I handed my phone to her and she read the Persian box. She was overjoyed and excited! Fortunately, the congregation had a Thanksgiving Meal that night and we were sure to invite Mary and her family. We (including Mary!) concluded our conversation with high spirits and optimistic our continuing relationship with Community of Christ. It's amazing how "welcome" translates both linguistically and emotionally. We are called to generously extend hospitality and invitation to all. No doubt this welcome manifests differently (i.e. relying on Google Translate), but nevertheless God continues to reveal God's self, especially outside of the sanctuary. What an outstanding summer in the Mid-Atlantic Mission Center! Whether your time was filled with family vacations, trips to the beach, time at Deer Park, or maybe enjoying a warm evening walk, I pray you found time with God over the last couple months. It’s too easy to focus on the busyness of packing for vacation and getting through security lines instead of appreciating the time together with friends and family, or recognizing the opportunities to reconnect with those in your car, rather than worrying about traffic slowing you down. Spending time with God can be difficult, but if we allow ourselves to be open to the depth of God’s presence, we begin to understand the power of transformative witness. We are called not only be in the presence of God, but we are to share those testimonies AND invite people to experience relationship with Christ. I recognize God is not always the first thought when you think about summer vacation, but by some miracle (whether we realize it or not) God is woven into all of creation. As we bring the summer vacation to a close, we are challenged not simply to continue the “dance” with God, but to invite others to the dance floor by sharing our testimonies! Over the next few months, I encourage you to boldly share your summer stories of community and transformative witness. Not just in the confines of church or morning worships, but share at school, work, the grocery store, and with your families. Inviting God into these sacred spaces is a wonderful ministry and I look forward to hearing your stories of transformative witness. Doctrine and Covenants E-book Now Includes Section 165! We're excited to announce that the Doctrine and Covenants e-book for Amazon devices and apps has been updated to include Section 165. This new section was approved in June by the 2016 World Conference of Community of Christ. If you have previously purchased the entire e-book, a standalone version o Section 165 is also available. Community of Christ is registered as a charitable organization eligible to receive donations from the AmazonSmile Foundation.